I have been working on this figure for weeks, on and off. But I decided I needed to finish it so I could actually use it in my friend’s Dungeon World game. This is really the first figure I’ve painted to completion, and the first of our Bones Vampire reward level miniatures that I’ve painted. I was attempting to get an inner glow on the crystal, but I think I need to work on my blending. I also trimmed the pointy elf hood to make it less, well, pointy. I think that worked well. 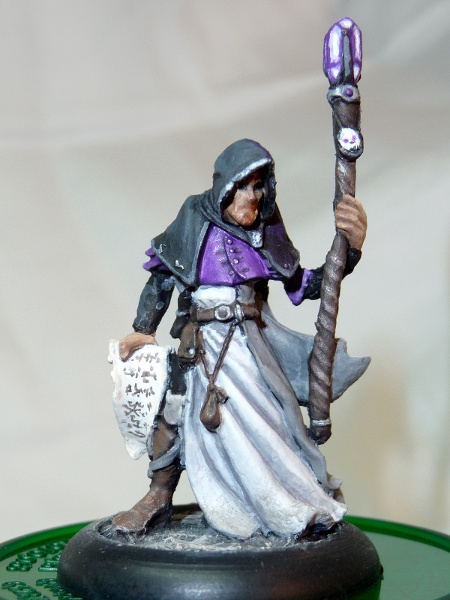 And I’m really happy with the shading on the robes. Although it has some issues, I’m quite happy with it. I have reigned-in my perfectionism and actually called something finished. This is actually a big deal for me. 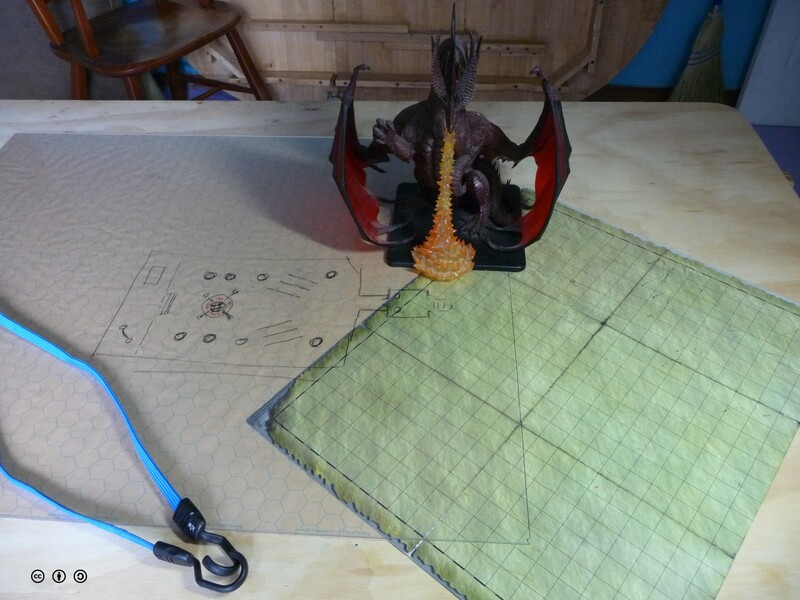 This entry was posted in D&D, Gaming, Making and tagged crafting, D&D, Gaming, miniatures on February 18, 2015 by Geoff. 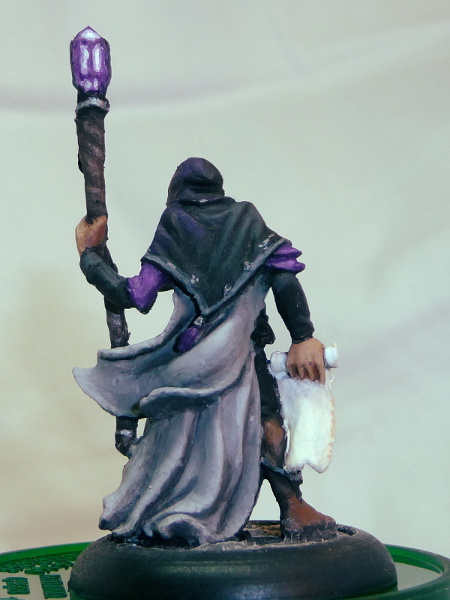 We’ve been casting lots of Wiz-War pieces over the past weeks. I finally got some masonite to use as a base for the game board segments, to which we would glue the floor and spacer tiles. I cut a square of masonite to size. 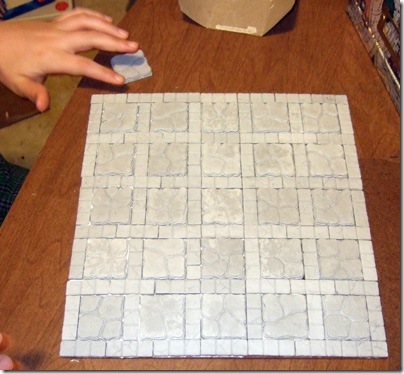 Then we spread a generous layer of Tacky Glue and laid the tiles and spacers down. 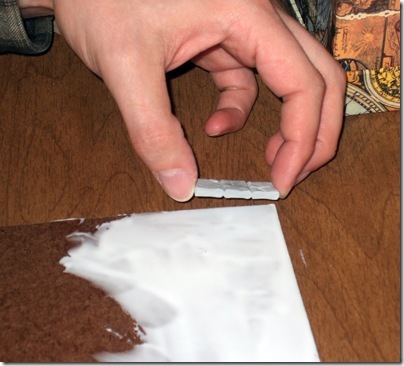 Tacky Glue is thicker than typical white (PVA) glues, and it sets up quickly. So we worked in sections. After all the pieces were set, we put another square of masonite and some encyclopedias on top to help it dry flat. 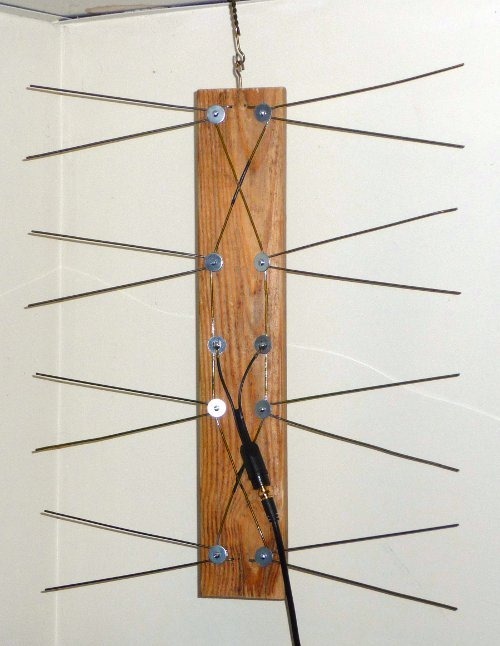 This entry was posted in Family, Gaming, Making and tagged crafting, Family, Fun, Gaming, WizWar on February 8, 2009 by Geoff. When we attended the Carnage gaming conference in November, NatureBoy and I played a game called WizWar, and had a great time. The game itself is out of print, but rules and materials can be downloaded and used to make your own game set. Of course, having played on a beautiful three-dimensional game board, we didn’t want to play on a flat cardboard set. For Solstice, NatureBoy and I got two silicone rubber molds ( #88 and #285 ) from Hirst Arts, and 25 pounds of a dental plaster casting stone called Merlin’s Magic from a supplier in Massachusetts. 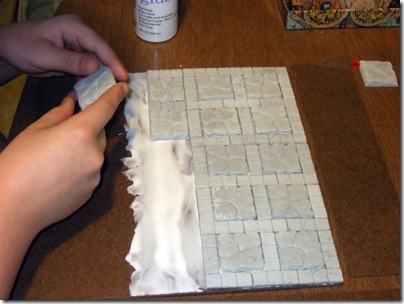 Following the instructions on the Hirst Arts site (here and here), we’ve started creating the pieces necessary for the WizWar board. 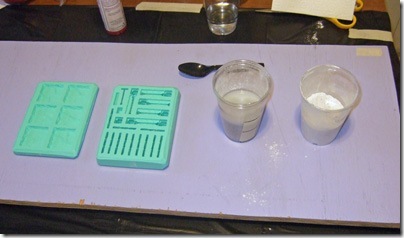 Here are the two molds, and some Merlin’s Magic getting mixed on top of the mixing board. 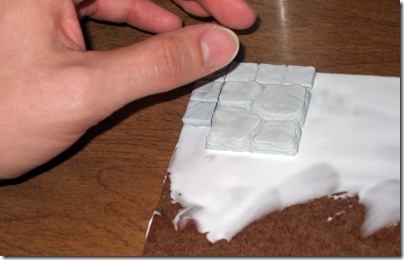 This entry was posted in Family, Fun, Gaming, Making and tagged crafting, Gaming, NatureBoy, projects, winter solstice, WizWar on December 27, 2008 by Geoff. I built a picnic table during my vacation in August. 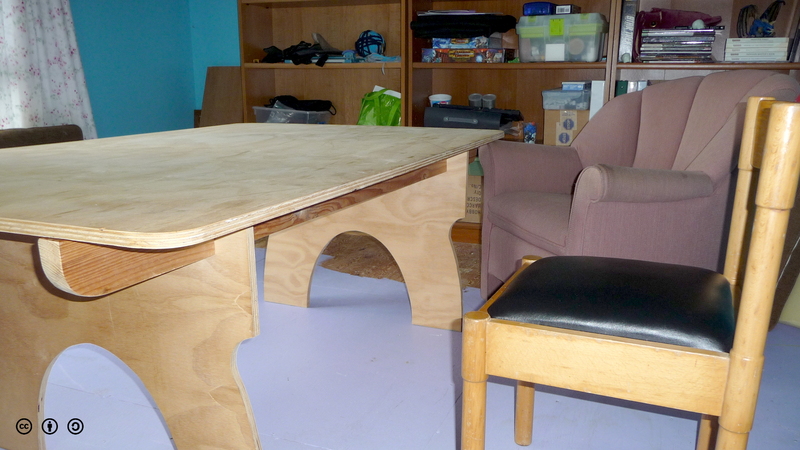 I hadn’t built anything this involved in quite a while, probably not since the chicken coop over ten years ago. It seemed like this ought to be a pretty straight-forward project, and I spent time looking at plans online until I found a set that I liked. Then it was off to the local hardware store for lumber and fasteners. 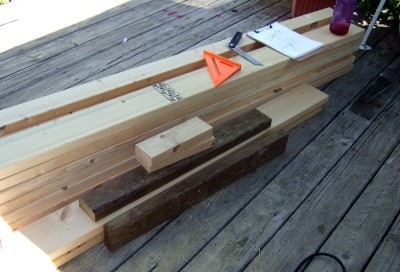 I decided to make the legs out of pressure-treated lumber, but the rest is regular 2x framing material. 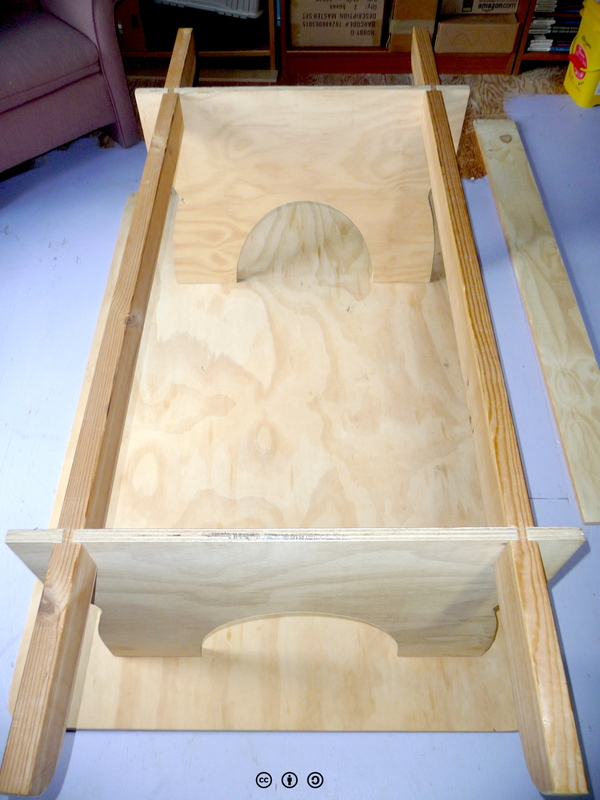 Part B, cross stretcher that supports the seats, needs to be 60" long (as indicated in the elevation), not 84". 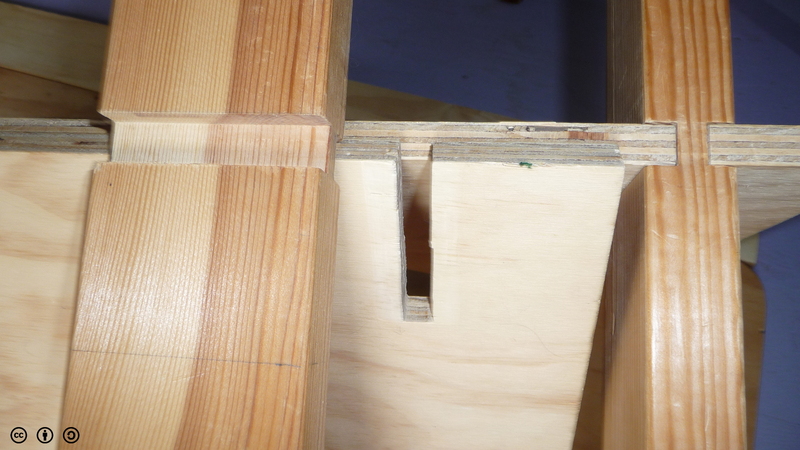 Part D, seat members, need to be 84" (same as table top), not 11-1/4". Luckily, I was very careful to measure twice, and double-check the diagrams, before cutting. 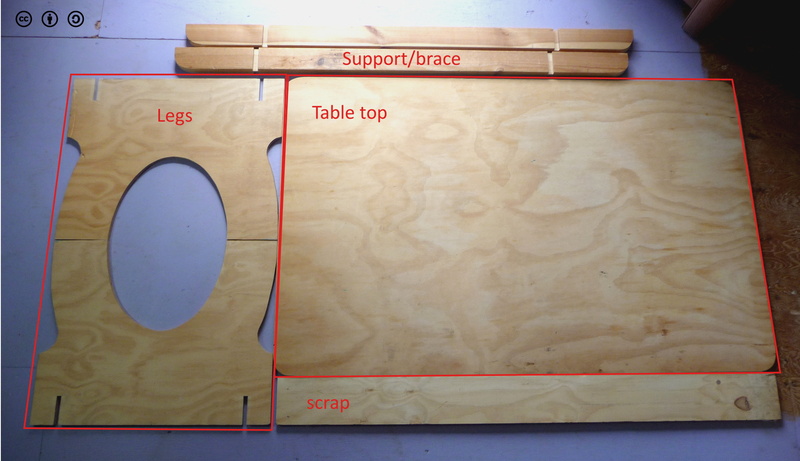 This entry was posted in Family, Learning, Making and tagged picnic table, projects, woodworking on September 21, 2008 by Geoff. My Beloved Wife’s blog persona is “CraftyMommaVT” and it fits her perfectly. Part of her internship early this summer involved creating a tool for the Skilled Nursing Facility where she was working. She thought through how to make it really useful, worked really hard and carefully, and the final result is beautiful. She does a better job than I can in describing the project, but the top offers some fine motor challenges, the bottom a standing checkers game, and all of it encourages patients to stand for longer periods of time to build strength and endurance. The crafty trait apparently is genetic, and Nature Boy exercises his creative energies routinely. Recently, he decided that he needed to add some diversity to his boffer weapon arsenal. See the boffer war hammer he put together? Let me tell you; it packs quite a wallop! We have more raw materials, too, so I anticipate more fun with foam, CPVC, and lots of duct tape. 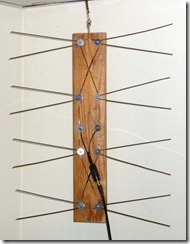 This entry was posted in Family, Life, Making and tagged boffer, crafting on July 23, 2008 by Geoff.